SCOPe (Structural Classification of Proteins — extended) is a database developed at the Berkeley Lab and UC Berkeley to extend the development and maintenance of SCOP. SCOP was conceived at the MRC Laboratory of Molecular Biology, and developed in collaboration with researchers in Berkeley. Work on SCOP (version 1) concluded in June 2009 with the release of SCOP 1.75. 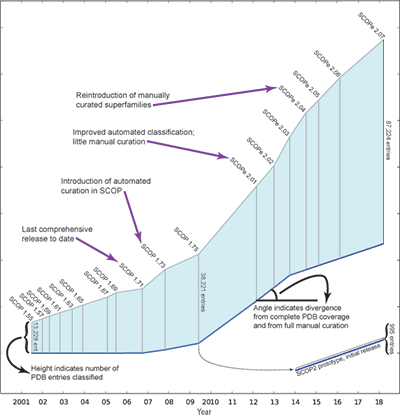 SCOPe classifies many newer structures through a combination of automation and manual curation, and corrects some errors in SCOP, aiming to have the same accuracy as the hand-curated SCOP releases. SCOPe also incorporates and updates the Astral database. 2019-03-05: We added an additional archive of PDB-style coordinate files for domains that were inadvertently omitted from our coordinate file archives. 2018-11-30: We published a paper describing updates to SCOPe, focusing on our findings from classifying large structres. [PDF]. 2018-03-02: SCOPe 2.07-stable has been released, with nearly 10,000 new pdb entries added since the last stable release. Click either the About or Stats & History links for more details on what's new! 2012-03-23: Bug fix: we discovered and corrected a bug that affected the sccs identifiers for 400 domains. Read more. Click for information about changes to SCOP(e) design and size.